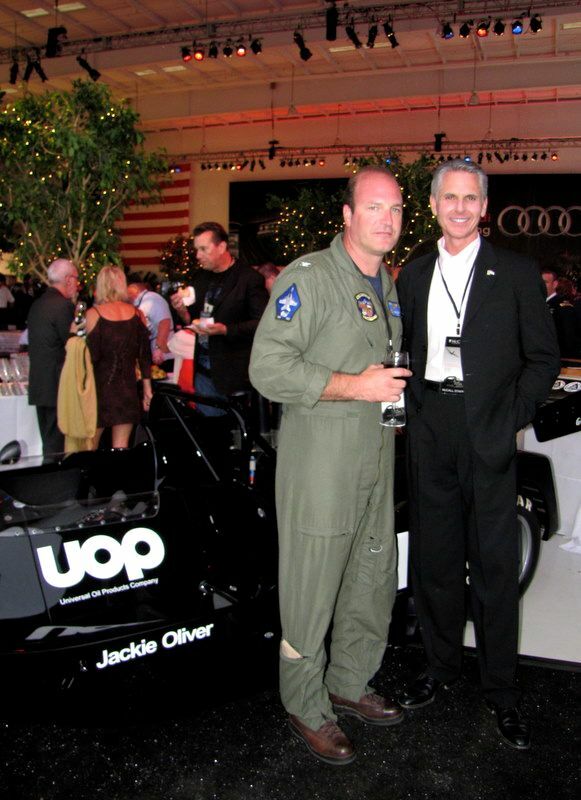 The McCall Motorworks Revival 2010 was held Wednesday, August 11th at the Monterey Jet Center in Monterey, California. In a hanger overflowing with private passenger jets, priceless vintage cars, auto designers and collectors, one only had to follow the red carpet to a complete night of pleasure and awe. The charity event is a fund raiser for the California Highway Patrol 99-11 Foundation, and tickets are at a premium. McCall and Motorworks thoughtfully included attendees from the Monterey Naval Post Graduate School, and, recognized U.S. military personnel abroad. The Motorworks event also showcases local wines and delectable gourmet creations. From Shramsberg champagnes to Red Tail and Kingfisher beers, tables overflowed with mouthwatering Monterey Bay seafood, a wide array of hors d’oeuvres and pastry creations from local chefs and restaurants, such as Il Fornaio. Auto aficionados and ‘foodies’ floated in Jet Hanger Heaven feasting, chatting and taking in displays from Bonhams’ and wide array of private collections such as Mallya, Canepa, and Steve Moal. Not to be overlooked were the jets, from fighters to a plush 10 seat passenger business jet open to tour. Two beautiful Navy helicopter pilots (female, 25 year olds) circulated. Gordon McCall, a class judge at Pebble Beach Concours d’Elegance for decades, is a well-known figure in the classic car world and a Monterey icon. Co-founder of “The Quail” with Sir Michael Kadoorie and Peninsula Hotels Group, when not racing, Gordon McCall is launching new projects. In an interview, Mr. McCall reflected only momentarily when asked “What is new and exciting at this year’s Revival?” “‘The Shadow,’” he replied.” Don Nichols’ legacy car may have a museum in the works on the Ryan ranch. Don Nichols, a young age 87, was very excited about the plans and possibility. C.H.P. favorite. The Jaguar XK13 was accompanied by Factory Test Driver, Norman Dewes, now 90 years old. The new Morgan was shown by Charles Morgan and wife from Santa Monica. Local San Francisco Bay Area talent included restorer/designer Canepa of Scotts Valley and Steve Moal of Oakland. 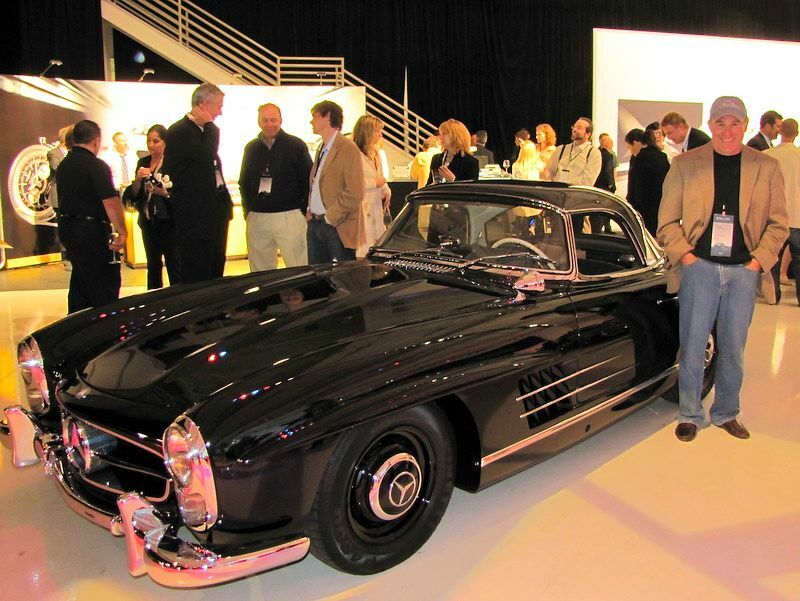 Bruce Canepa displayed a perfectly restored 300 SL Roadster. One-off maestro Steve Moal showed his Italian/Zagato inspired “Gatto” (a ‘double bubble’ design by Jimmy Kilroy, owned by Bill Grimsley). Collection Manager Malcolm Page of the Mallya collection in Sausalito brought the team’s 2009 Kingfisher F1 VJM2/04, which went from pole position to finish second at Spa. Motorworks Revival is a perfect beginning to Monterey Week. Expect more surprises and talent next year. As the 2010 Monterey Week auctions attested, there is always a budget for world class vintage autos and motorcycles, and perfection is always in style.